Male Boss Is Explaining The Digital Currency Market Tot His Female Secretary At The Office. Businessman is talking to blond female secretary at the office reception. Young lady in blue shirt is standing at the wooden counter and male guest in expensive suit is near. The space is big, bright with white walls, dark leather sofa and lockers. The portrait of blonde female secretary who is looking for her boss in the office. The manager in blue shirt is holdin the red folder with documents in her hands and turning her head while going through the corridor with glass room walls. The male manager meets his new female colleague in the bright office corridor. The boss greets the secratary and shakes her hand. The professional wears suit and his subordinate has blond hair and is in blue shirt. The space is modern and the walls of the rooms are made with glass. The young female student has a consultation with her male supervisor in his office. People sit at the big wooden table in the comfortable chairs and taking some notes with their pens. The professor in the suit asks the lady questions about her research in finance. The woman with blond hair wears blue shirt and a whiteboard is behind. 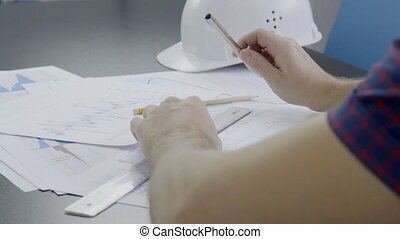 Male designer is working in his studio on the project. 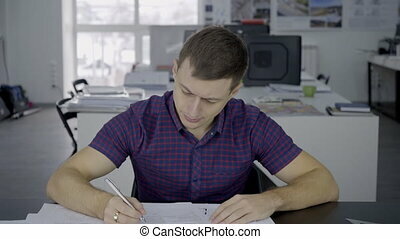 Young professional in purple t-shirt is sitting at the table and drawing on the papers. The big space with tables and window is on the background. 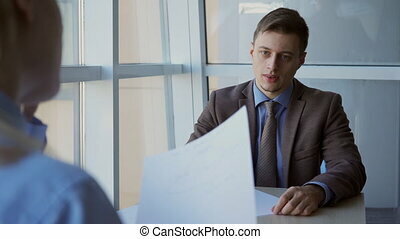 The portrait young financial analytic who is checking the bitcoin exchange rates reports in his office. 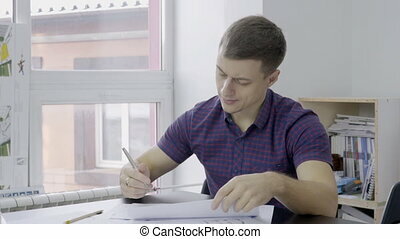 The man is sitting at the table near the window and looking to the papers with digital currency market situation and writing his decision about investments on it. 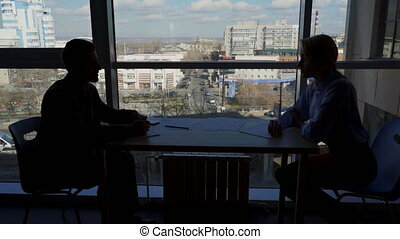 The silhouettes of female and male workers sitting at the table while co-working. The colleagues have a conversation and take notes on the paper. The desk is in front of the big window with fascinating view to sunny city. 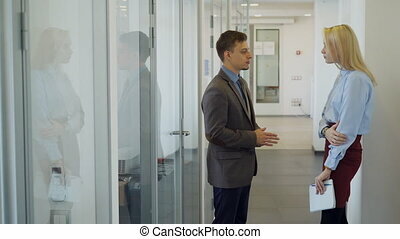 The young businessman is looking for the room to rent in modern office building and female secretary is assing him. The man in expensive suit meets the woman on the reception and the pair is going through the corridor with glass walls of the conference halls.